The Breckwell P2000 has a very large bay window affording an excellent view of the fire, so good that the optional brick fireback and logset are probably a necessity for the stove to look good. 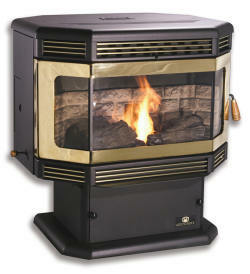 This stove is modern in appearance, although first produced in 1998, and doesn't have the stepped top. It produces 50,000 btu. and will burn for 70 hours without refilling the hopper. The P2000 has a large ash pan for a stove of this size, it is recommended to be emptied only after burning a ton of fuel. See comments below. The control board has some trouble shooting diagnostics which, with the manual, will help to pin down possible problems. Heating Area 2,200 sq. ft.
Max. Heat Output 50,000 btu. Weight Freestanding 300 lbs. Insert 240 lbs. Window Size 23 in. by 9 in. Flue Vent Size 3 in. Rear Vent Height Freestanding 12.4 in. Insert 6.75 in. Nickel or gold door trim. 28 in. by 40 in. 30 in. by 44 in. 32 in. by 48 in. There have been some problems with the A-E-033 convection fan seizing. This is being replaced with the C-E-029 fan. Try to make sure the newer fan is fitted. It's recommended that the Breckwell P2000 not be run for more than one or two hours at a time on the high heat setting to prevent damage. Ashes must be brushed or scraped into the ashpan. There is no ashpan in the insert model, ashes must be scraped out into a suitable non combustible receptacle. Empty the burn pot, clean the glass, brush out the combustion chamber and clean the heat exchange tubes. 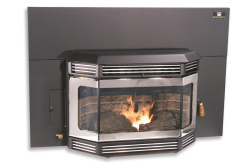 If you would like to leave a review of the Breckwell P2000 pellet stove or fireplace insert, please use the form on the contact page.